The number of 2G subscribers has been declining since 2009 and the 3G subscriber total began to fall in 2016—but this has almost been balanced by the growth in popularity of 4G services. There were 372 million 4G customers in Europe at the end of 2017, up from 286 million 12 months before, representing more than 35 percent of the total wireless market by end-2017. 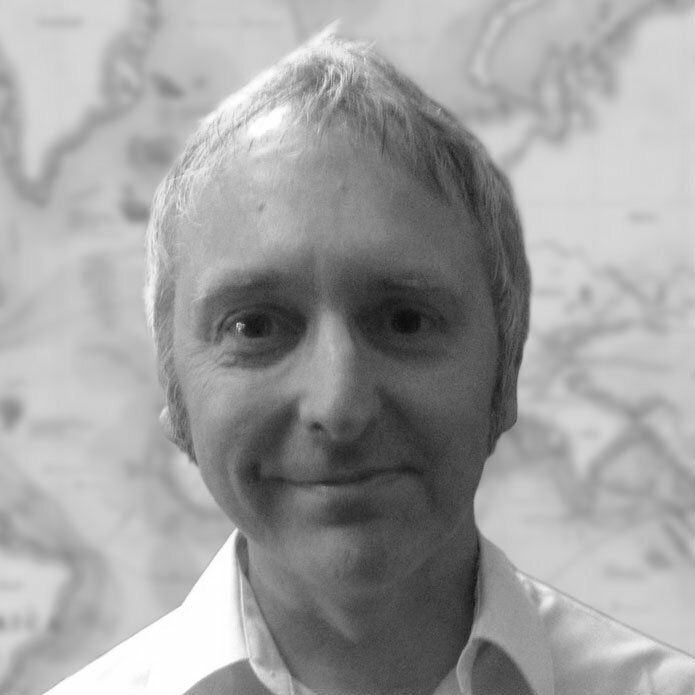 TeleGeography’s GlobalComms Forecast Service expects the number of 4G users to reach 709 million by December 2022. 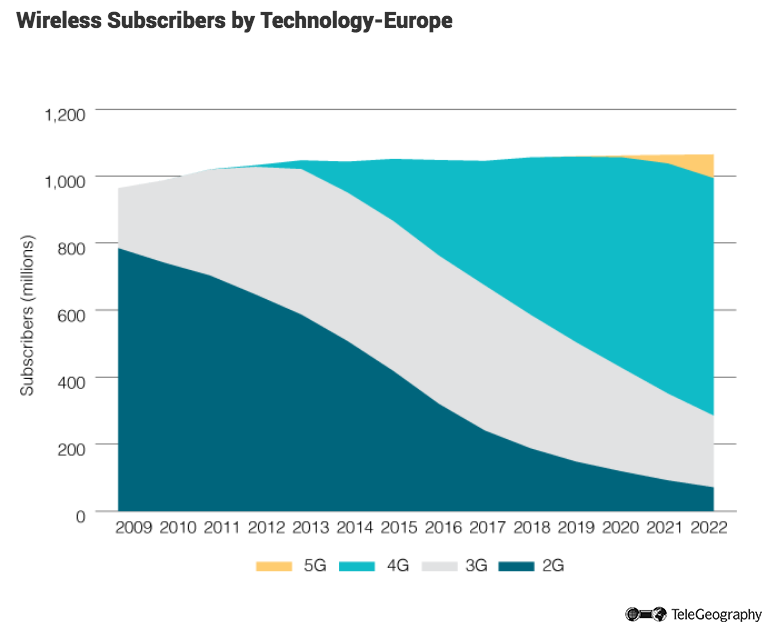 5G technology is expected to make its mark from 2020 onward, with a forecast of 5.7 million subscribers in Europe by the end of that year, rising to 71.3 million two years later. The popularity of 4G and 5G services is set to help the overall market enter a new period of growth, albeit limited, with the user total predicted to grow to 1.065 billion by the end of 2022. Average revenue per user (ARPU) has been declining steadily over the past few years. The regional average fell from $30/month in 2012 to $20.40 in 2017. The decrease is partly due to high levels of competition in most European countries, coupled with saturated mobile markets. Another factor hitting ARPU levels has been the regulatory changes that have cut mobile termination rates and ended international roaming fees within the European Union. So-called Roam Like at Home legislation came into effect in June 2017, meaning all voice calls, SMS, and data usage within the EU is charged at the same rates as it would be on the home network. Data services are accounting for a growing slice of operator revenues. At the end of 2017, data made up almost 37 percent of the average monthly ARPU in Europe. That’s up from 35 percent a year earlier and around 22 percent at end-2012. Although overall ARPU is falling, average minutes of use (MoU) for voice services continues to rise. The average MoU for operators in Europe rose from around 305 minutes/month in 2014 to 340 minutes in 2017. Russia is home to the largest European wireless market, with 243 million mobile customers at the end of March 2018. In Western Europe, Germany leads the way, with 113 million subscribers, followed by the U.K. with 91 million. Most European wireless markets are dominated by three or four major players, with strong competition—but fairly stable market shares—held by main providers. However, several countries have new players on the scene. In 2012, France saw the launch of fourth network operator Free Mobile by local telecom group Iliad. This had a dramatic effect on the mobile sector, with its low-cost unlimited tariffs creating a strong challenger for the incumbent trio of Orange, SFR, and Bouygues Telecom. Indeed, such has been Free Mobile’s success that it overtook the subscriber total of Bouygues in the second half of 2017 and claimed 19.4 percent of the French market by March 2018. Iliad is also looking to make its mark in Italy, where it introduced services in May 2018. The firm attracted around 300,000 customers in its first month of operation, again targeting the low-cost segment of the market. Its entry has prompted incumbent operators TIM, Wind Tre, and Vodafone to launch their own cut-price sub-brands and tariffs in an effort to defend their customer bases and reduce migration to the new provider. With the prospect of 5G services just around the corner, the European cellular sector will be set for more changes over the next few years.